Shakespeare’s Globe is situated on the South Bank of the Thames in Southwark. It is a modern reconstruction of the Globe Theatre, an Elizabethan playhouse that was originally built-in 1599, destroyed by fire in 1613, rebuilt in 1614, and then finally demolished in 1644. 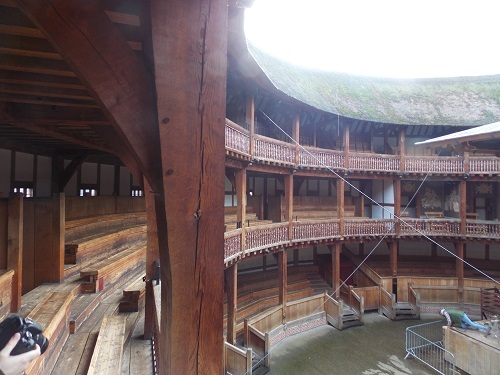 The modern Globe is situated around 700 ft from the site of the original theatre and was designed to recreate as near as possible the experience of watching a play in the time of Shakespeare. The modern Globe was created due to the initiative of American actor and director Sam Wanamaker and is based on the original Globe of 1599, although there are no plans of the theatre, considerable academic research went into the design to make it as accurate as possible to the original. 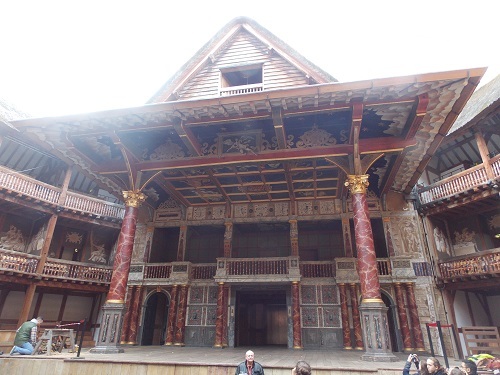 The tour guides tend to be very knowledgeable and some are actors in their own right and entering the theatre offers a unique experience, walking through the wooden doors you are transported into the days of Shakespeare. To the modern theatre goer, the facilities are a bit of a shock with the theatre open to the elements and the most rudimentary seating. There is no microphones or speakers, all music is played live and the audience can be seen by the actors as the plays are performed in daylight or lit by internal lighting. One major difference between Shakespearian and Modern Theatre is that in the original Globe, the audience were not passive but part of the action. There tended to give feedback to the action, if the audience did not like the action they were not shy to let the actors know. In rebuilding the Globe, the organisation went to considerable lengths to be ‘authentic’ , It is built from materials available in 1600 (oak, lime plaster, and thatch) using construction methods of the period: the oak timbers are joined together with wooden pegs. Costumes are made from the textiles of 1600, such as linen, wool, leather, and silk, based on patterns and garments surviving from the early 17th Century. Inside the theatre, it is necessary to understand how the Shakespearian Theatre worked. The stage thrusts out into the yard where up to 700 people can stand to watch a performance. These members of the audience often paid just a penny for the cheapest view and were referred to as ‘groundlings’ or by more derogatory names such as ‘penny stinks’. If you had a little more money, you would be seated in the boxes and if you were very privileged in the Gentlemens’ Boxes/Rooms or Lords Rooms. The stage is covered by the Heavens, the roof painted with stars, moons, and signs of the zodiac. Beneath the stage is Hell, an area from where devils or witches might appear. Above the stage is the Attic where sound effects are created. 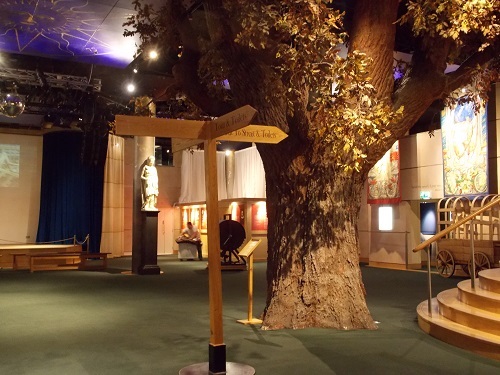 After a tour of the theatre itself, visitors can explore the exhibition based under the Globe Theatre that explains in more depth, the life of Shakespeare, the London where he lived, and the theatre for which he wrote. It also provides some insight into the area surrounding the Globe which was once London’s most notorious entertainment district, surrounded by taverns and bawdy-houses. Since the theatre opened in 1997, it has staged a large number of acclaimed plays and events. Because it is open to the elements, performances are restricted to May through to October. 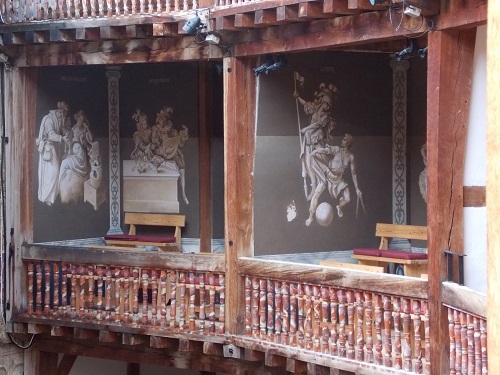 In 2014 the Theatre opened a new Jacobean Theatre based on one that was located in Blackfrairs. It is known as the Sam Wanamaker Theatre and plays will be performed all year round. 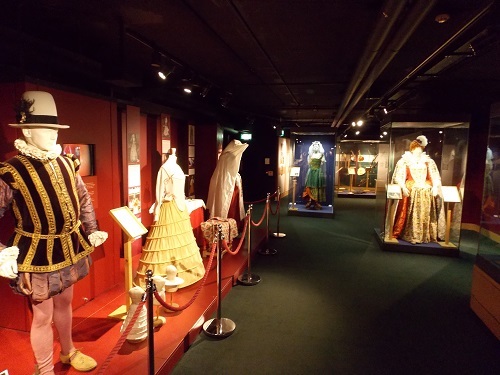 The Shakespeare’s Globe Exhibition and Tour offers a interesting and entertaining insight in Elizabethan Theatre. 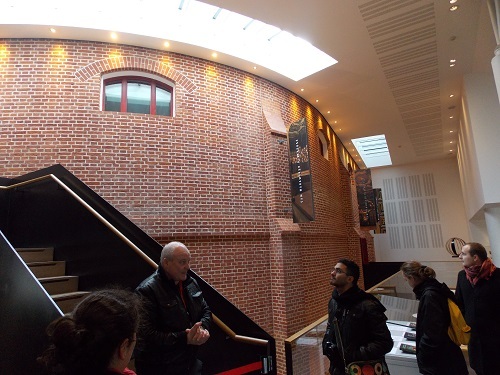 The building of the theatre itself is a major achievement and the tour guides explain in detail how the vision of Sam Wanamaker came into being and has provided a wonderful monument to Shakespeare and English Theatre. 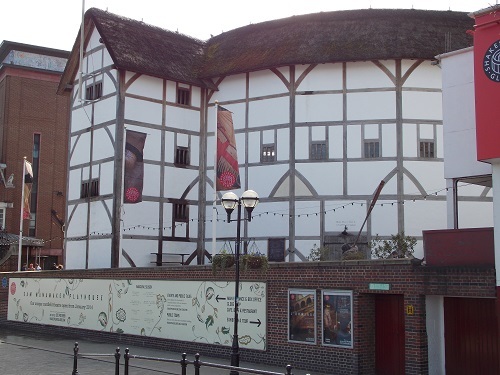 The Shakespeare’s Globe Exhibition and Tour will appeal to a wide range of people and all ages, it is an opportunity to be transported back in time to understand the type of environment in which one of the world’s greatest playwrights learnt his trade. There is no doubt that Shakespeare’s Globe Theatre is one of the more unique sights in London. Tours depart every 30 minutes. First tour at 9.30am, last tour at 5pm. Tours depart every half an hour between the times shown and the tour itself lasts for around 40 minutes and you can explore the exhibition at your leisure. There is no need to pre-book for the Exhibition & Tour. Tickets can be bought on the admissions desk on the day, every day. By londonvisitors2014 in Bankside, London Attractions, London Theatres on January 16, 2014 .